Larger predators, such as sharks, spend most of the time in the middle or mesopelagic zone of the open ocean. In the range of depth between 1,000 and 3,000 meters (3,300 and 10,000 ft), virtually no light penetrates and the water is at the temperature – an average of 4°C 939°F) – at which it reaches its greatest density. The life below 1,000 meters is made up of free-swimming fish, shell-fish, and cephalops possessng body fluids at the same hydrostatic pressure as the environment and having approximately the same degree of salinity. At night some mid-water dwellers migrate to the surface to feed on other animals which in turn graze on the plankton pastures. The pelagic zone is an oceanic zone that is neither close to shore or to the bottom of the ocean. 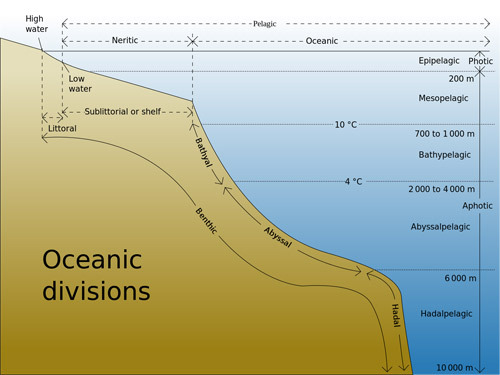 Pelagic organisms live anywhere in oceans, seas, or lakes, except on the bottom (see benthos). They are divided into nekton (large fish and whales) and plankton (small plants and animals) on which the nekton feed. The middle or mesopelagic zone of the ocean holds myriads of fish, accompanied by larger invertebrates such as squid, octopuses, and prawns. This is the habitat of the sea's active predators, but it is one with no shelter. In order to survive the threat of large carnivores the creatures of the mesopelgic must either be armed with powerful defensive apparatus, such as the stinging cells of the jellyfish Rhizostoma spp and Cyanea spp, or be adept swimmers equipped with sensory apparatus efficient enough to detect the approach of potential enemies. For this reason the most streamlined of all fish, both prey and predators, are found in the mesopelagic zone and include such species as the bonito (Katsuwonus pelamis) and the mackerel shark (Lamna nasus). Other protective mechanisms of pelagic fish include shoaling behavior and bioluminescence.